Yogurt drink with L.Casei Danone cultures, vitamins B6 and D, and vanilla flavouring. With vitamin D & B6 to support normal function of immune system. No preservatives, colours and artificial flavours. 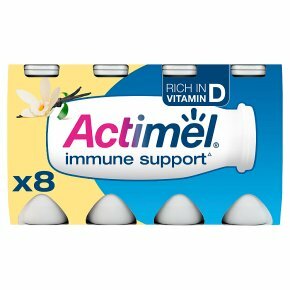 Suitable for vegetarians.Start your day with Actimel With Vitamins B6 & D to support the normal function of the Immune System. It also contain L. casei cultures. Shake before use! Recommended consumption: 1 bottle per day.